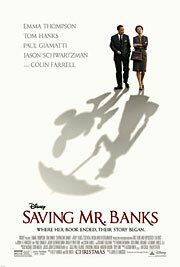 The trailer for “Saving Mr. Banks” resembles the film only slightly more than “The Shining” resembles that fake trailer for the film that made the rounds 10 or so years ago. In the trailer, “Mr. Banks” looks light and fun, with a little playful back-and-forth between the frigid, overprotective writer and the movie executive who’s looking to turn her pet project into box office gold. Nora Ephron made this movie with Meg Ryan four or five times (twice with “Banks” star Tom Hanks, strangely enough), and we all know that it ends with the two finding some middle ground while learning to be more understanding of others. Except that this movie isn’t even remotely like that. Instead, “Saving Mr. Banks” is a dark, painfully sad journey of a grown woman still looking to redeem her long-lost father, occasionally broken up by moments of levity. This makes for a more emotionally complex story, which is a nice surprise, but it doesn’t always make for a better story. The flashback timeline is informative, but the present day timeline is more interesting. It is the year 1961, and P.L. Travers (a spot-on Emma Thompson) has been fielding calls from movie mogul Walt Disney (Tom Hanks) for 20 years about adapting her book “Mary Poppins” for the silver screen. Her answer has always been a steadfast ‘no,’ but when a financial adviser friend of hers reminds her that she’s almost out of money, Mrs. Travers agrees to fly to Los Angeles, meet with Walt, and consider the possibility of allowing Disney and his team to work their “magic” on her beloved Mary. From the beginning, though, Mrs. Travers has objections to their treatment of the material, and in flashback, we see why: as a young girl in rural Australia in the early 1900s, Mrs. Travers had a wonderful relationship with her father (Colin Farrell), an otherwise unreliable and occasionally foul-tempered drunk who nonetheless adored his eldest daughter “Ginty” and encouraged her to think creatively. She lost him at an early age, and she’s clearly still stinging from the loss, and the fact that Disney and his staff doesn’t understand what “Mary Poppins” means to her, in both a literal and figurative sense, infuriates her.